This week our challenge was to create a project inspired by a pattern or texture found "in the wild." True to form, it took me a few days before I started paying attention for inspiration. 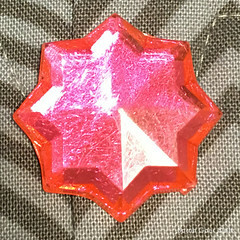 After snapping a few pictures while I was out, I became fixated on my son's plastic faceted gems. I chose to focus on this one. I loved the geometry of it, and the dart shape you can see in the reflection above. My initial sketch included the edges around the perimeter, but I edited those out in favor of a more simple design. My finished quilt is 24" x 24". Here are a few close up shots of the quilting. 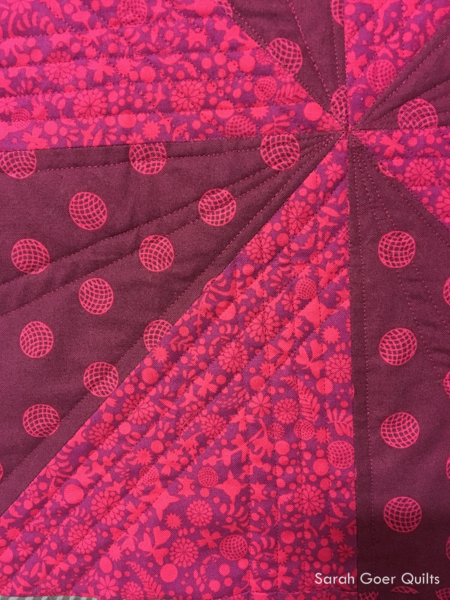 My pink quilting motifs came from Angela Walters' Shape by Shape books and were stitched with coordinating 50wt Aurifil thread. 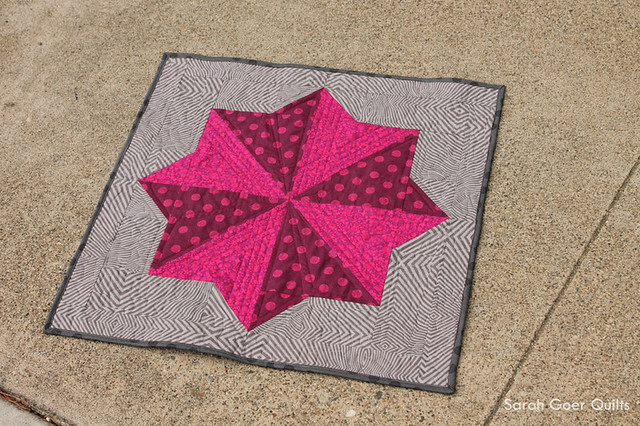 I'm linking up to Project Quilting 8.3. Posted in Quilting. 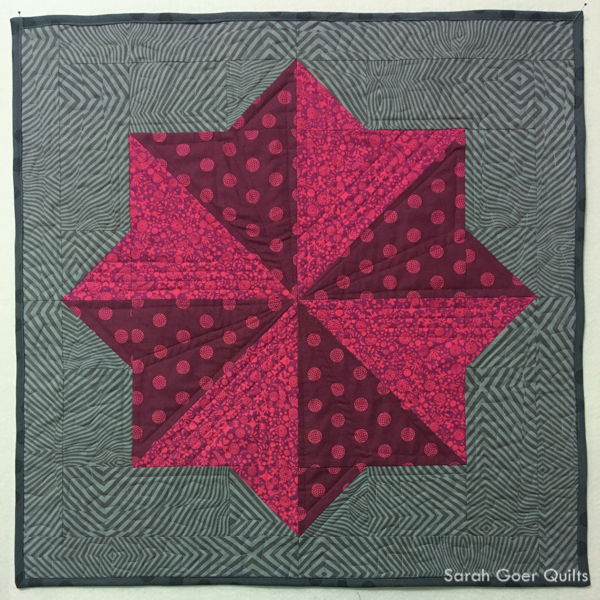 Tags: finished quilt, mini quilt, Project QUILTING on February 5, 2017 by sarah. What a beautiful project. 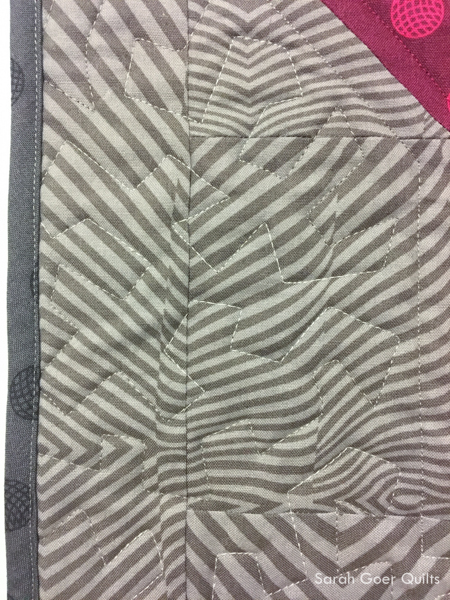 I especially like the up-close photos that showcase your quilting. Well done! Thank you! I did my best with middle of the night photography since I knew I wouldn't have time this morning to take daylight photos. ;-) Thanks for visiting! Great use of contrast in your fabric selection to help play up the texture of the button, and the background print adds a cool extra dimension as well! You did another great job with your interpretation. I am in awe that you managed to start and finish the construction in less than 1 day! Wonderful dimension to your quilt design/fabric choices and love the quilted textures!! And now we get to breathe for 1 week until round 4 starts back up! Thank you, Mel! It was a very long day. If only I wasn't so exhausted today as a result of my one day quilt. ;-) I'm not sure I get to breathe. I keep thinking, "what else do I need to work on before the next challenge starts?" I think the short list is two swap minis and my UFO challenge (which is at least a small one). 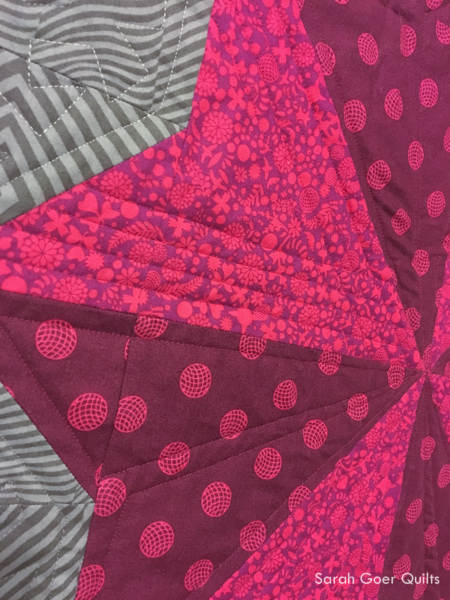 Plus quilting my January UFO challenge. Very nice. 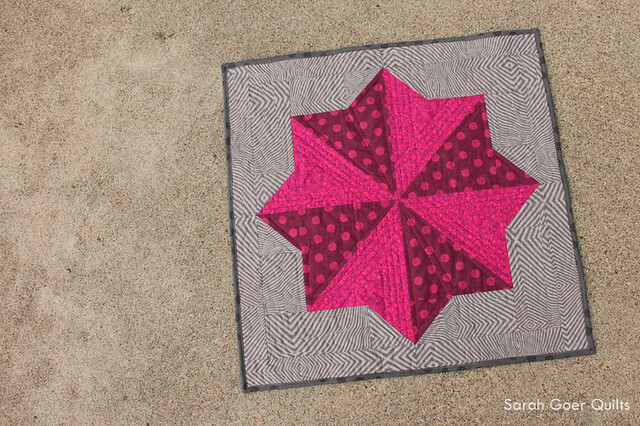 Love the color contrast and the quilting. Also, the pattern to the background fabric is great- almost dizzying. Good job Sarah! Thank you, Bernie! I'm so glad I went with the funky background fabric. I considered a solid white, but decided against it. Sarah, such an amazing job in a very short timeline! It is so fun to see the arc from inspiration to finished project. Even though FMQ is not something I am choosing to spend my time on these days, I think it is likely I will want to develop that skill in the future, so I'm saving your posts as good FMQ references. Aww, thank you so much, Mary. The Angela Walters Shape by Shape books are gold for FMQ inspiration! This is so cool - I love the inspiration, and then how you implemented it. What a cute project! Love it! (Especially the quilting.) 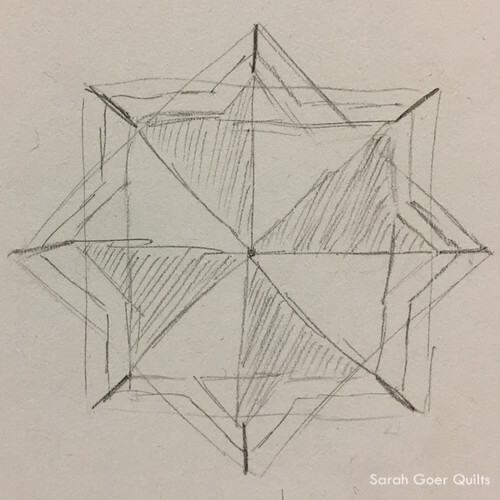 The shape was very reminiscent of a pattern that I want to try someday (assuming that my skill set ever improves enough for me to do so). Take a look at the Night Sky quilt that I have on my "My Style" Pinterest Board. I love that sort of stuff. Oh, Night Sky is a pretty one! My friend Anja made one recently. And before that she sent me a purple Night Sky mini. Such a lovely gift! I'm not sure how hard the construction is, but I see it calls for a specific template. Thank you for visiting, Robin.